The twelve animals of the Chinese zodiac are divided into elements, each with slightly different characteristics - this year is a Wooden Horse. With slightly weaker traits to other horses, but clear thinking and the power to replace old for the new. Free spirited, volatile, with dynamic yang energy. 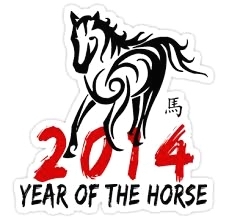 All horses are considered fortunate and bring good luck. Horses represent freedom and are graceful, generous and noble. Adults sleep standing because of their weight, but only for 3-hours a day. Their ears can swivel 180-degrees and they have larger eyes and memories than elephants. Horses have sensitive skin and gallop from danger at up to 50-mph, but if necessary can defend themselves. They love crowds. Horses are happy, loyal, intelligent, unselfish, enthusiastic and fun. Although they talk too much, and are impatient hot-blooded stubborn pessimists, needing support. Their wasteful spending is bad for finance, but they're un-materialistic. Horses like to dance and travel, hating silence and discipline. Their flamboyance stems from independence and not listening to others. Easily fall in love, yet get their hearts broken - and mix well with tiger, dog, or goat people; but not rats, monkeys or rabbits. Those born during this year will have a good 2014. Independence will bring luck and prosperity, but also health issues and accidents. Careers may suffer: good jobs are an athlete, teacher, technician, driver or politician. Don't be afraid of new ventures, but control emotion and think twice before marrying. A good year for having a baby. Barbara Streisand, Clint Eastwood, Genghis Khan, Isaac Newton, Jimi Hendrix, Neil Armstrong, Oprah Winfrey, Paul McCartney, Ray Charles, Rembrandt, Sean Connery and Teddy Roosevelt. Predictions for 20132014 is posed to be very energetic with all feelings amplified. Many will change the energy around them bringing surprise to financial markets. March bears a highly volatile conjunction with Uranus by Mars and Aries. Keep cool and vigilant. This is a good year to travel: the further the better. There will also be the opportunity to develop spirituality. Under a horse year there is no middle ground with conflicts. Rising oil, food costs and extreme weather will bring protest. The US will prosper economically, but have continued gun trouble. Western Europe may struggle politically and economically, however, a leadership change in Southern Europe and the Middle East helps. The Far East and China continue to boom, and China will begin to innovate rather than copy, but will have problems with natural disasters. Professor Boyle of Cambridge University thinks a 'doomsday moment' will happen in 2014. He claims that during the last 500 years, a catastrophic international event occurred in the middle of the second decade of each century - and the present financial crisis could be a trigger. He fears the US with its military dominance and falling economic power. Saying "everything depends on whether America can react more imaginatively to decline than Britain did before 1914". Claiming "peace is only possible if the world realizes that an age of individual nations is over and a system of global governance is introduced".